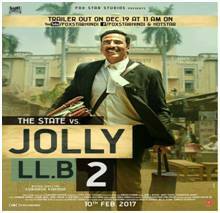 The shooting of Jolly LLB 2 commenced on 18 July 2016, with Saurabh Shukla. schedule of the film shooting started on 15 August 2016, with a 25-day schedule in Lucknow. The film was shot in Chattar Manzil in Lucknow. Later the shooting will move to Varanasi, and finally it will be wrapped in Kashmir. Also, the director decided to take one shot in Amity University, Lucknow campus on 04 September.